The name of Drummond may be derived originally from the parish of Drymen, in what is now the western district of Stirlingshire. The Gaelic name is Druiman, signifying a ridge, or high ground. 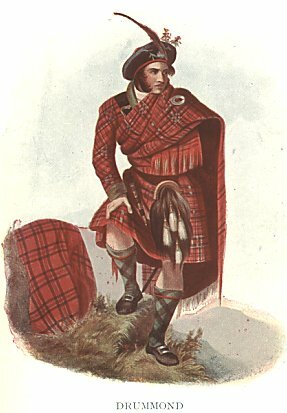 An ancestor of the noble family of Perth thus fancifully interprets the origin of the name: Drum in Gaelic signifies a height, and onde a wave, the name being given to Maurice the Hungarian, to express how gallantly he had conducted through the swelling waves the ship in which Prince Edgar and his two sisters had embarked for Hungary, when they were driven out of their course on the Scottish coast. There are other conjectural derivations of the name, but the territorial definition above mentioned appears to be the most probable one. The chief of the family at the epoch of their first appearing in written records was Malcolm Beg (or the Little), chamberlain on the estate of Levenax, and the fifth from the Hungarian Maurice, who married Ada, daughter of Malduin, third Earl of Lennox, by Beatrix, daughter of Walter, lord high steward of Scotland, and died before 1260. Two of his grandsons are recorded as having sworn fealty to Edward the First. The name of one of them, Gilbert de Dromund, "del County de Dunbretan", appears in Prynne's copy of the Ragman Roll. He was Drummond of Balquapple in Perthshire, and had a son, Malcolm de Drummond, who also swore fealty to Edward in 1296, and was father of Bryce Drummond, killed in 1330 by the Monteiths. The other, the elder brother of Gilbert, named Sir John de Dromund, married his relation, a daughter of Walter Stewart, Earl of Menteith, and countess in her own right. His eldest son, Sir Malcolm de Drummond, attached himself firmly to the cause of Bruce. King Robert, after the battle of Bannockburn, bestowed upon him certain lands in Perthshire. He married a daughter of Sir Patrick Graham of Kincardine, elder brother of Sir John Graham, and ancestor of the family of Montrose. He had a son, Sir Malcolm Drummond, who died about 1346. The latter had three sons, John, Maurice, and Walter. The two former married heiresses. Maurice's lady was sole heiress of Cencraig and of the stewardship of Strathearn, to both of which he succeeded. The wife of John, the eldest son, was Mary, eldest daughter and co-heiress of Sir William de Montefex, with whom he got the lands of Auchterarder, Kincardine in Monteith, Cargill, and Stobhall in Perthshire. He had four sons, Sir Malcolm, Sir John, William, and Dougal; and three daughters - Annabella, married, in 1357, John, Earl of Carrick, high steward of Scotland, afterwards King Robert the Third, and thus became Queen of Scotland, and the mother of David, Duke of Rothesay, starved to death in the palace of Falkland, in 1402, and of James the First, as well as of three daughters; Margaret, married to Sir Colin Campbell of Lochow, Jean, to Stewart of Donally, and Mary, to Macdonald of the Isles. About 1360, in consequence of a feud which had long subsisted between the Drummonds and the Menteiths of Rusky, the residence of the family seems to have been transferred from Drymen, in Stirlingshire, where they had chiefly lived for about two hundred years, to Stobhall, in Perthshire, which had some years before come into their possession by marriage. Sir Malcolm Drummond, the eldest son, succeeded to the earldom of Mar in right of his wife, lady Isabel Douglas, only daughter of William, first Earl of Douglas. His death was a violent one, having been seized by a band of ruffians and imprisoned till he died "of his hard captivity". This happened before 27th May 1403. Not long after his death, Alexander Stewart, a natural son of "the Wolf of Badenoch", a bandit and robber by profession, having cast his eyes on the lands of the earldom, stormed the countess' castle of Kildrummie; and, either by violence or persuasion, obtained her in marriage. As Sir Malcolm Drummond had died without issue, his brother, John, succeeded him. John's eldest son, Sir Walter Drummond, was knighted by King James the Second, and died in 1455. He had three sons: Sir Malcolm his successor; John, dean of Dunblane; and Walter of Ledcrieff, ancestor of the Drummonds of Blair-Drummond (now the Home Drummonds, Henry Home, the celebrated Lord Kames, having married Agatha, daughter of James Drummond of Blair-Drummond, and successor in the estate to her nephew in 1766); of Cairdrum; of Newton, and other families of the name. The eldest son of the main stem, that is, the Cargill and Stobhall family, Sir Malcolm by name, had great possessions in the counties of Dumbarton, Perth, and Stirling, and died in 1470. By his wife Marion, daughter of Murray of Tullibardine, he had six sons. His eldest son, Sir John, was first Lord Drummond. Sir John, the eldest son, was a personage of considerable importance in the reigns of James the Third and Fourth, having been concerned in most of the public transactions of that period. He died in 1519. By his wife, lady Elizabeth Lindsay, daughter of David, Duke of Montrose, the first Lord Drummond, had three sons, and six daughters, the eldest of whom, Margaret, was mistress to James the Fourth. Malcolm, the eldest son, predeceased his father. William, the second son, styled master of Drummond, suffered on the scaffold. William had two sons, Walter and Andrew, ancestor of the Drummonds of Bellyclone. Walter died in 1518, before his grandfather. By Lady Elizabeth Graham, daughter of the first Earl of Montrose, he had a son, David, second Lord Drummond, who was served heir to his great-grandfather, John, first lord, 17th February 1520. Of his two sons, Patrick, the elder, was third Lord Drummond; James, the younger, created, 31st January 1609, Lord Maderty, was ancestor of the viscounts of Strathallan. Patrick, third Lord Drummond, embraced the reformed religion, and spent some time in France. He died before 1600. He was twice married, and by his first wife, Elizabeth, daughter of David Lindsay of Edzell, eventually Earl of Crawford, he had two sons and five daughters. The elder son, James, fourth Lord Drummond, passed a considerable portion of his youth in France, and after James the Sixth's accession to the English throne he attended the Earl of Nottingham on an embassy to the Spanish court. On his return he was created Earl of Perth, 4th March 1605. John, the younger son, succeeded his brother in 1611, as second Earl of Perth. The Hon John Drummond, second son of James, third Earl of Perth, was created in 1685 Viscount, and in 1686 Earl of Melfort; and his representative Captain George Drummond, duc de Melfort, and Count de Lussan in France, whose claim to the earldom of Perth in the Scottish peerage was established by the House of Lords, June 1853, is the chief of the clan Drummond, which, more than any other, signalised itself by its fidelity to the lost cause of the Stuarts. BADGE: Lus mhic Righ Bhreatinn (thymis syrpillum) mother of thyme. PIBROCH: Spaidsearachd Duic Pheart, the Duke of Perth�s March, and the Lady Sarah Drummond. IN view of the recent devastating war with Austria-Hungary, it is curious to remember that, according to tradition, one at least of the great historic houses of Scotland derives its descent from Hungarian stock. The commander of the vessel in which Edgar the Atheling, with his mother and his sisters Margaret and Isabella, set sail for Hungary to escape the usurpation of Harold, is said to have been Maurice, son of George, son of Andrew, King of Hungary. As every Scotsman knows, the vessel was driven into the Firth of Forth, and the Princess Margaret presently became the wife of the mighty Canmore, Malcolm III., King of Scots, with far-reaching effects on the subsequent history of Scotland. The King, it is said, made Maurice Steward or Thane of Lennox, a title still held by the Drummond chief, and bestowed upon him the lands of Drymen on the Endrick, from which his descendants took their name, and which they continued to possess for some two hundred years. It is said to have been in commemoration of their ancestor�s achievement in bringing Queen Margaret to Scotland that, when coats of arms came into existence, the Drummonds adopted the device of three bars wavy, or and gules, representing the sunset waves of the North Sea. In the time of Alexander II., Maurice�s great-great-grandson, Malcolm Beg Drummond, further secured the status of his family by marrying Ada, daughter of the Earl of Lennox, and granddaughter of the High Steward of Scotland; and his grandson, Sir John Drummond of that ilk, Thane of Lennox, appears in history as a stout defender of Scottish liberty against the usurpation of Edward I. of England. He was summoned to Parliament as one of the greatest barons of the kingdom. It was his son, again, Sir Malcolm Drummond, who suggested to King Robert the Bruce the strewing of caltrops in the way of the English cavalry at the battle of Bannockburn. "Gang warily," the family motto adopted by his descendants, is said to bear reference to that suggestion. For his services on that occasion he obtained from the King certain lands in Perthshire, which had the effect of removing the family seat from Loch Lomondside to the central district of Scotland. It was a few years later that the house made its first alliance with the Royal family. Margaret Logie, the beautiful, imperious second wife of Bruce�s son, David II., was a daughter of the house of Drummond. Though she was the widow of John de Logie, who had been executed for his part in the great Soulis conspiracy against King Robert the Bruce, King David was infatuated with the spell of her beauty, and could refuse her nothing; and with her extravagant pilgrimages to Canterbury and the satisfaction of such personal spites as that by which she induced the King to cast the Steward and his sons into prison, she led David a pretty dance, till he divorced her at Lent in 1369. Hereupon she collected her wealth, betook herself to the Papal Court at Avignon, and continued to make trouble till her death shortly afterwards. Meantime, by the marriage of Sir John Drummond, grandson of the Drummond who fought at Bannockburn, to Mary the daughter and heiress of Sir William de Montifex, the family had come into possession of Stobhall on the Tay and large possessions in Perthshire, and a further alliance with the royal house was made when Sir John�s eldest daughter Annabella became the wife of King Robert III., and was crowned with him at Scone in September, 1390. Through this marriage all the succeeding Kings of Scotland and of Britain have been descended from the House of Drummond, and there is Drummond blood in the veins of most of the crowned heads of Europe. Annabella�s elder brother, Sir Malcolm, married Isabel Countess of Mar, sister of the Earl of Douglas who fell at Otterburn. Sir Malcolm was murdered by Alexander Stewart, natural son of the fierce Wolf of Badenoch and grandson of Robert II., who forcibly married the Countess and assumed the title of Earl of Mar, fighting under that name at Harlaw and Inverlochy. Annabella�s younger brother, Sir John, who succeeded as Chief of the Drummonds, was Justiciar of Scotland. But the house had not yet reached the summit of its fortunes. The Justiciar�s great-grandson, another Sir John Drummond, of Cargill and Stobhall, was a distinguished statesman in the reign of James III., and for his services as Ambassador Extraordinary to England, to arrange the marriages of the King and his sons with princesses of the House of York, was made a Lord of Parliament in 1487. Mycht merk hir wirth and myte. The nobles of Scotland, however, had other views for their sovereign�s future. So long as the alliance with the fair Lady Margaret remained only a distraction, they were prepared to regard it as a mere sowing of wild oats, but when the lady gave birth to a daughter, and it was rumoured that she had been secretly married to the King, they became seriously alarmed. Their desire was that James should marry a daughter of the English royal house, and when it became clear that the Lady Margaret Drummond was a definite obstacle to the match, her fate appears to have been sealed. Lord Drummond was just then building his new mansion of Drummond Castle in Strathearn, and one morning after breakfast there, in 1501, the Lady Margaret, with her sisters, Lady Fleming and Sybilla, were seized with sudden sickness, believed to have been caused by poison, and in a few hours were dead. The three lie buried in a curious vault covered with three fair blue marble stones joined close together about the middle of the choir of the Cathedral Church of Dunblane. At that time the family burying-place at Innerpeffray had not yet been built. Whatever his sins in conniving at this affair, Lord Drummond was to see much sorrow in the years that remained to him. His eldest son Malcolm died before him unmarried, and his second son William, Master of Drummond, had a darker fate. At that time the Drummonds were endeavouring to set up a barony burgh of Drummond, and the market cross which they actually procured for the purpose is still to be seen beside the Town House of Crieff. But the Murrays of Auchtertyre had a similar ambition, and the cross of Crieff set up by them is also to be seen a stone-cast away. The rivalry came to a head when the Abbot of Inchaffry commissioned Murray of Auchtertyre to poind some cattle of the Drummonds for the payment of a debt. William, Master of Drummond, raised his clan to avenge the insult. He was met by the Murrays at the little hill of Knockmary, but, reinforced by a body of Campbells, the Drummonds put the Murrays to flight. The latter took refuge in the little kirk of Monzievaird, at Auchtertyre, and the Drummonds, having failed to find them, were on the point of returning to their own territory, when a Murray, seeing his chance, was ill-advised enough to shoot an arrow from a window of the kirk, and kill his man. Thereupon the Drummonds, heaping brushwood round the little straw-thatched fane, set it on fire, and burned to ashes the church itself and eight score of the Murrays concealed inside. For this deed the Master of Drummond was arrested, tried at Edinburgh, and, notwithstanding his father�s importance and influence, was duly executed. His son Walter, who, on his father�s death, also became Master of Drummond, likewise died before his grandfather, and it was his son David, great-grandson of the first Lord, who, on the death of the latter in 1519, succeeded as second Lord Drummond. Meanwhile a third son of the first Lord, Sir John Drummond of Innerpeffray, had distinguished himself among the Scottish soldiers of fortune abroad, and had become captain of the Scots Guards of Henry II. of France, Several considerable families of the name are descended from him, but most interesting perhaps is the fact that, through the marriage of his second daughter to the Master of Angus, he became grandfather of the Earl of Angus of James V.�s time, and, by the marriage of that Earl of Angus to Queen Margaret, widow of James IV., became ancestor of Henry, Lord Darnley, husband of Mary Queen of Scots, and ancestor of all the later monarchs of Britain. To the end of his days the first Lord Drummond continued to play a highly distinguished part in Scottish history. He was the ambassador sent to the English Court by James IV. before the battle of Flodden, to secure the necessary delay for his master�s warlike preparations; and, along with the Earl of Huntly and the Earl Marischal, after the fall of James, he gave valuable support to the party of the Regent Queen Margaret and her husband, the Earl of Angus, against the faction headed by the Earl of Arran. It must have been with tragic feelings that, four years before his own death, he learned of the death on Flodden�s fatal field of James IV., whom he had loyally served, and whom he had once hoped to look upon as a son-in-law. David, the second Lord Drummond, himself married a princess of the Scottish royal house, Margaret, daughter of Alexander, Duke of Albany, and granddaughter of King James II. By her, however, he had no children. By his second wife, Lilias, daughter of Lord Ruthven, he had two sons, Patrick the elder of whom became the third Lord Drummond, while James the second son was in 1609 created Baron Maderty, and became ancestor of the Viscounts Strathallan, who were to succeed to the chiefship of the family through this link three hundred years later. Meanwhile the elder line of the Drummonds was to continue a highly distinguished and romantic career. James, the fourth Lord, after acting as ambassador for James VI. to the Court of Spain, was in 1605 created Earl of Perth. The earldom was created with remainder to heirs male whatsoever, and its first heir was the Earl�s brother John. This chief of the Drummonds was a Royalist officer in the short brilliant campaign of the Marquess of Montrose. He married Lady Jean Ker, daughter of the first Earl of Roxburghe, through which marriage his fourth son William became second Earl of Roxburghe and ancestor of the three first Dukes of that name. The third Duke of Roxburghe, with whom the line of Drummond Dukes of Roxburghe ended, was the famous book collector, after whom a certain well-known book binding takes its name. Meanwhile the Earl of Perth�s eldest son James succeeded to his father�s own earldom. By Lady Anne Gordon, daughter of the Marquess of Huntly, he had two sons, both of whom played a distinguished part on the Jacobite side at the time of the Revolution and after. The elder brother James, fourth Earl of Perth, was Chancellor of Scotland, passed with his royal master to France at the Revolution in 1689, and was created Duke of Perth by James VII. at St. Germains in 1695. His son James, Lord Drummond, having taken part in the Earl of Mar�s rebellion in 1715, was attainted, and therefore could not succeed to the Earldom of Perth, which accordingly became dormant at his father�s death in the following year; but by the Jacobites he was styled the second Duke of Perth, that title having been confirmed in France by Louis XIV. in 1701, on the death of King James, at the same time as the titles of the Dukes of Berwick, Fitz James, Albemarle, and Melfort, all of which were Jacobite dukedoms in the same position. The second Duke had two sons, and it was the elder of these, James, the titular third Duke, who was head of the family at the time of the last Jacobite rebellion. He was living with his mother at Drummond Castle, when it became known that Prince Charles Edward had landed in the West Highlands. The Government of George II. knew his sympathies, and sent an officer, his neighbour, Captain Murray of Auchtertyre, to effect his arrest. The family were at dinner when Captain Murray arrived, and the Duke insisted upon deferring business until the meal was over, This being done, after a glass of wine the Duke proposed that they should join the ladies, and politely opened the door to allow his guest to pass first. He did not, however, follow him, but, closing the door and turning the key, escaped by another exit, and in a few moments was galloping away to join the Prince. He was wounded at Culloden, and died on the passage to France on board the French frigate La Bellone a month later. Something of the Jacobite ardour of the family can be gathered from the fact that, after the cause was finally lost, his mother caused the fine lake at Drummond Castle to be formed to cover up for ever with its waters the stables which had been polluted by the Hanoverian cavalry of the Duke of Cumberland. The second Duke�s brother, Lord John Drummond, had also taken an active part on the Prince�s side. Sir John Cope, who was afterwards to earn unenviable fame by his defeat at Prestonpans, had encamped in the park of his house of Ferntower, near Crieff, and on the way northward to Culloden the Prince himself had lodged both at Drummond Castle and at Ferntower. Lord John was therefore attainted along with his elder brother, and the Drummond estates were forfeited in 1746. It was for him that the famous regiment of Royal Scots in the French service was raised. He died without issue in 1747, and was succeeded in turn by his uncles, John and Edward, as fifth and sixth titular Dukes of Perth. Edward, however, died without children in 1760, and with him ended the whole male line of James fourth Earl of Perth, by the attainder of whose son James, Lord Drummond, in 1715, the Earldom of Perth had become dormant. This title was now revived in the person of James Drummond, grandson by his first wife of John, second son of the third Earl. This John Drummond had been General of the Ordnance and principal Secretary of State for Scotland in the time of Charles II., and had been raised to the peerage as Viscount Melfort in 1685 and as Earl of Melfort in 1686. Like his brother, the fourth Earl of Perth, he had followed James VII. to France, and had been made Duke of Melfort at the Jacobite Court in 1692, with succession to the children of his second wife, the title being confirmed as above mentioned by Louis XIV. in 1701. By an Act of the Scottish Parliament, the Earldom of Melfort was attainted and forfeited in 1695, but he continued to be known as titular Duke of Melfort. His third son William was Abb�-prieur of Li�ge, and his fourth son, a Lieutenant-General in the French Army, and Grand Cross of St. Louis, was ancestor of three generations of distinguished officers in the French service who bore the title of Comte de Melfort. The Duke�s eldest son by his first wife, James Drummond of Lundin, as already mentioned, came in as chief of the Drummonds in 1760. He was served heir to the last Earl in 1766, and thereupon assumed the title of Earl of Perth. His son, James Drummond, eleventh Earl of Perth, had the Drummond estates in Strathearn restored to him by the Court of Session and Parliament in 1785. At his death in July, 1800, however, these estates passed to his only daughter, Lady Willoughby de Eresby, whose grandson, the Earl of Ancaster, possesses them at the present day. Meanwhile John Lord Forth, eldest son by his second wife of the first Duke of Melfort, had succeeded as second titular Duke of Melfort, and inherited the Melfort estates which had been granted to his father by James VII. He married the widow of the Duke of Albemarle, who was countess and heiress of Lussan in her own right, and he had two sons, the younger of whom, styled Lord Louis Drummond, was second in command of the Royal Scots at Culloden, and became a lieutenant-general in the French service, Grand Cross of St. Louis, and Governor of Normandy. It was his grandson James Louis, fourth Duc de Melfort, and Comte de Lussan, a general in the French service, who on the death of the eleventh Earl of Perth in 1800 became twelfth Earl of Perth and Chief of the Drummonds. He died nine months later, and was succeeded in all these titles by his brother, Charles Edward. In 1803 the latter began proceedings in the Court of Session to assert his claim, but had the action dismissed for a technical reason, and, as he was a Roman Catholic prelate, he could not bring his claim before the House of Lords. After his death in 1840, however, his nephew, George Drummond, established his pedigree before the Conseil d�Etat of France and the Tribunal de Ia Seine, and his right of succession to the French honours of Duc de Melfort and Perth, Comte de Lussan, and Baron de Valrose. He was sixth Duc de Melfort and fourteenth Earl of Perth, and by Act of Parliament in 1853, was restored to the honours of his house in this country as Earl of Perth and Melfort, Lord Drummond of Cargill and of Stobhall and Montifex, Viscount Melfort and Forth, and Lord Drummond of Rickertown, Castlemaine, and Galstown, Thane of Lennox, and hereditary Steward of Strathearn. On the death of this Earl at a great age in 1902, however, the entire male line of Patrick, third Lord Drummond, became extinct, and the chiefship of the clan, along with the family honours, was inherited by Viscount Strathallan, representative of James, Lord Maderty, second son of David, second Lord Drummond, of the time of King James III. The first Lord Maderty was raised to the peerage by James VI. in 1609, and, like all others of the Drummond family, his house remained steadfast supporters of the Stewart cause in Scotland. His second son, Sir James Drummond of Machany, was Colonel of the Perthshire Foot in the Engagement to rescue Charles I. in 1648, and Sir James�s grandson, Sir John Drummond, was forfeited in 1690 for his adherence to the cause of James VII. at the Revolution. His eldest son William, however, in 1711 succeeded his distant cousin of the elder line as fourth Viscount Strathallan. Meanwhile David, the third Lord Maderty, who married a sister of the Royalist Marquess of Montrose, was also a supporter of the cause of Charles I.; and William, the fourth baron, held a high command like his cousin in the ill-starred Engagement of 1648. Later he fought at Worcester in the cause of Charles II., and, though taken prisoner, managed to escape and join the Royalist remnant in the Highlands, till it was dispersed by Morgan in 1654. He then joined the army of Russia, and attained the rank of lieutenant-general, but at the Restoration returned to this country, and was appointed a Lord of the Treasury and General of the Forces in Scotland. As a reward of his loyalty, he was in 1686 created Viscount Strathallan. It was at the death of his grandson, the third Viscount, that William Drummond of Machany succeeded to the title as above mentioned. Having taken arms for Prince Charles Edward, this lord was slain at Culloden, and his name, along with that of his eldest son, was included in the Bill of Attainder. It is interesting here to note that, while Strathallan was thus engaged in the Jacobite turmoils of the North, his brother Andrew was busy founding the well-known banking house of Drummond and Company, London, purchased the estate of Stanmore in Middlesex, and founded an important family there. Meanwhile the representation of the family was continued by the son and grandson of the attainted fifth Viscount. The grandson, who was a General and Governor of Dunbarton Castle, in 1810 petitioned fruitlessly for a restoration of the family honours. At his death in 1817, his cousin, James Drummond, son of William, second son of the fourth Viscount, became representative of the Strathallan family. The family honours were restored to him by Act of Parliament in 1824, and a new chapter in the family history opened. This second son, Sir James Drummond, G.C.B., was a Lord of the Admiralty, Officer of the Legion of Honour, and Knight of the Medjedie, while his third son, Edmond, was Lieutenant-Governor of the North-West Provinces of India, and his great-grandson is the eleventh Viscount, now Earl of Perth, and Chief of the Drummonds. His lordship succeeded his father, the tenth Viscount Strathallan, in 1893, and his cousin, the fourteenth Earl of Perth, and Drummond Chief, in 1902. 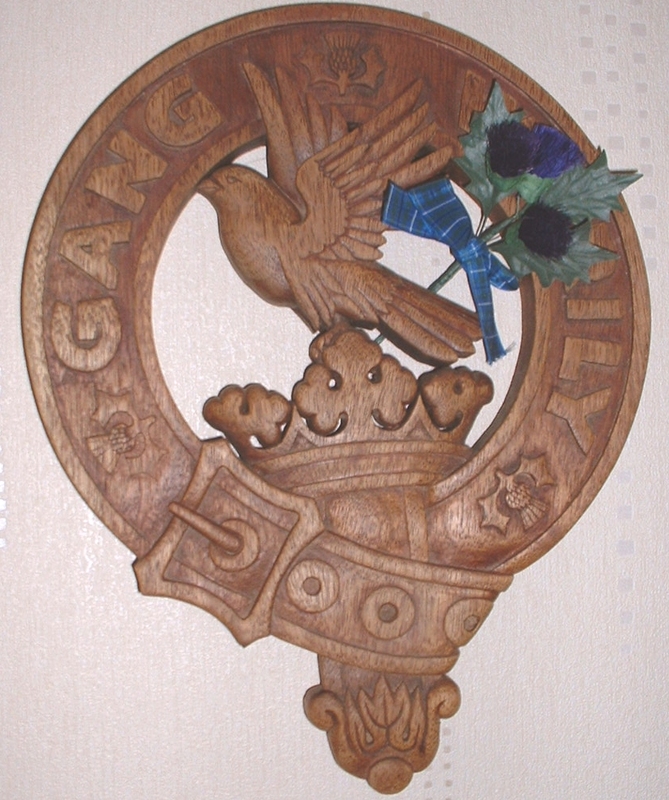 It is a long and strange tale, this, of a race which several times intermarried with the Scottish royal house, and several times ruined itself by giving that house its loyal and strenuous support; but there are few families or clans which, with so long a record, have so little to stain the honourable blazon of their arms. DRUMMOND: There is little doubt that this name has a territorial origin in the lands of Drymen in West Stirlingshire, but genealogical roots are less certain. Tradition avers a Hungarian origin, but equally they may be of noble Celtic stock, for their first identifiable ancestor was Malcolm Beg of Drymen who, in 1225, was Seneschal of these lands and from him derives the Chief's patronymic, "An Drumanach Mor" (The Great Man of Drymen). A later Sir Malcolm de Drymen was with Bruce at Bannockburn in 1314, and is traditionally credited with the use of the caltrops which crippled the English cavalry to so great effect. Their depiction in part of the Drummond arms, and the motto 'Gang warily', reputedly call this event. The Drummonds acquired Stobhall and Cargill in Perthshire through marriage to the Montfichet heiress about 1345, and of this line daughters married Kings David II and Robert III. In 1488, Sir John Drummond, the builder of Drummond Castle near Crieff, was created Lord Drummond and later, so tradition relates, King James IV secretly married his daughter Margaret, who bore him a child. Margaret and her sisters died in suspicious circumstances in 1502 and such, it is said, removed any bar to James's marriage to Margaret Tudor. In 1605 the 4th Lord was created Earl of Perth, and the 4th Earl made Duke by James VII. The 3rd Duke died during his escape following Culloden and the title expired with death of the 6th Duke in 1760. The Earldom was restored to the 14th Earl in 1853, and passed to the Strathallan line on his death in 1902. A son of the 2nd Lord Drummond had been created Lord Madderty in 1610, in whose line the 4th Lord Madderty became Viscount Strathallan in 1686. The 4th Viscount, who died at Culloden, is a direct ancestor of the present Chief. The Drummonds maintained their loyalty to the Stuarts, being forfeited for their part in the Risings of 1715, and 1745, when the 3rd Duke raised a regiment for the Prince. The name Drummond is thought to have originated from Drymen or Drummond in Stirlingshire. Tradition traces the Drummond family to Hungarian origins. Maurice, son of George a younger son of King Andrew of Hungary is said to have accompanied Edgar Atheling, heir to the English throne from Hungary to England. They were shipwrecked on the shore of the Forth and one of Atheling's sisters, Margaret married Malcolm III from whom Maurice received the estates of Drymen. However the first rec ords show that the son of Malcolm Beg who was Steward of the Earldom of Strathearn in 1255, also called Sir Malcolm, was the first to take the name of Drummond. Drummonds were staunch supporters of the Royalist cause, playing an important role in the Scots victory at Bannockburn in 1314. Margaret Drummond married King David II in 1369; Annabella Drummond was wife to King Robert III and mother of James I. In 1488 the Barony of Drummond was created; later generations added the titles Earl of Perth, Lord M adderty and Viscount Strathallan. The family continued their allegiances during the Jacobite risings of 1715 and 1745 which resulted in their lands being forfeited in 1746. The 4th Viscount Strathallan fell at Culloden. The lands were eventually restored by the General Act of Restoration of the Forfeited Highland Estates and remain in the possession of the family today, the chiefship being vested in the Strathallan branch of the family. The old Drummond estate passed through an heiress to the Earls of Ancaster.